Availability: PharmaPlus, Walmart, Target, Shoppers Drug Mart, etc. Claims: Removes and hydrates cuticles in one step. Instructions: Massage a small amount into cuticles until completely absorbed. Use a cuticle pusher, if needed, to help further loosen hard to remove cuticles. Use daily for maximum benefits. Wash hands before applying polish. Ingredients: Mineral Oil, Microcrystalline Wax, Ethylhexyl Palmitate, Polybutene, Caprylic/Capric Triglyceride, Ozokerite, Silica Dimethyl Silylate, Phenoxyethanol, Urea, Diisostearyl Malate, Fragrance, Sunflower Seed Oil, Shea Butter, Tocopheryl Acetate, Dipropylene Glycol, Camellia Sinensis Leaf Extract, Matricaria Flower Extract, Cucumber Fruit Extract, Rosemary Leaf Extract, Tocopherol, BHT, Titanium Dioxide (CI 77891), FD&C Yellow NO. 5 Aluminum Lake (CI 19140), FD&C Blue NO. 1 Aluminum Lake (CI 42090), Iron Oxides (CI 77491, CI 77492, CI 77499). 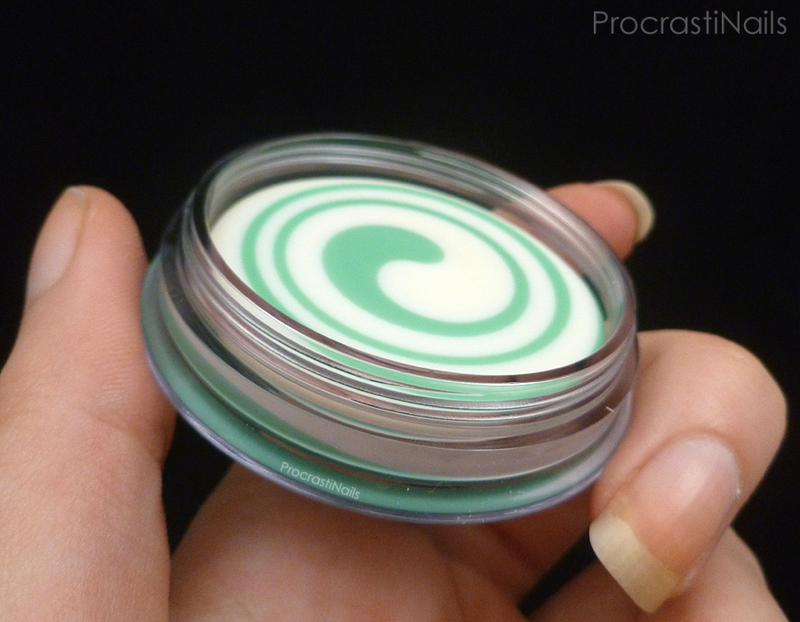 As soon as you go to rub up some of the balm from the super cute little container, you realize there's a problem: the two components (white and green) are not combined very well. So what you get is a glob of white while your green section stays more or less un-touched. Disappointing, but maybe it doesn't matter and will still work well despite that? Wrong. I'm going to guess the white is the moisturizer while the green is the cuticle remover, because when you apply this product and massage it in you get some moderately sticky moisturizing cream (think LUSH Lemony Flutter for consistency) but no movement on the cuticle front. When I say no movement I mean No. Movement. I massaged it in thoroughly and saw my cuticles hadn't budged an inch. "That's okay," I thought to myself, "I'll just use a cuticle pusher with it." But it hadn't even loosened my cuticles up enough to push them! 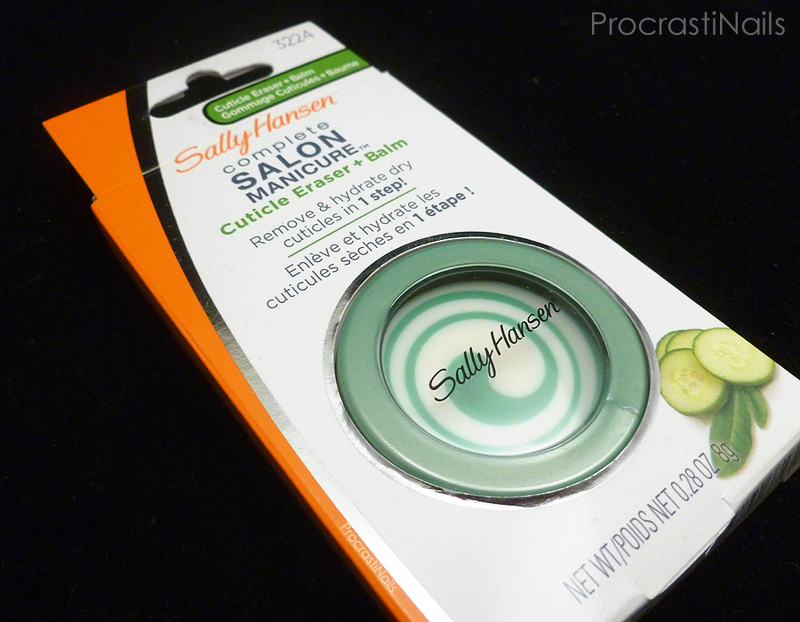 Maybe if you used this for a couple of days you would start to be able to make some movement with your cuticles, but why am I going to do that when I have another much better and instantly acting cuticle gel (Sally Hansen Instant Cuticle Remover) that I could use instead? I suppose I could dig some of the green out with a toothpick or something to see if that did anything, but really if it's making me go to that much effort it isn't worth it. On the positive side this product smells really good, and the way it's designed to look in the pot is really attractive. That cute little swirl is 80% why I wanted to try it! So the design and fragrance departments did a good job! But in terms of actual effectiveness? Not a good job. Would I pick it up again? I'm sure you've already guessed my answer to this question: absolutely not! This was one of the most disappointing products I've tried in a while. I would even say the most disappointing product ever. Some of that might be because I had high hopes for it after previous positive experiences with Sally Hansen products (I swear by their Instant Cuticle Remover Gel) and I was let down so spectacularly. I like the idea of a two-in-one remover and moisturizer product, but I really think Sally Hansen has to go back to the drawing board with this one. Cute esthetics don't make up for a terrible product! So that's how I feel. I tried not to be too harsh, but I really wanted to get across my disappointment. 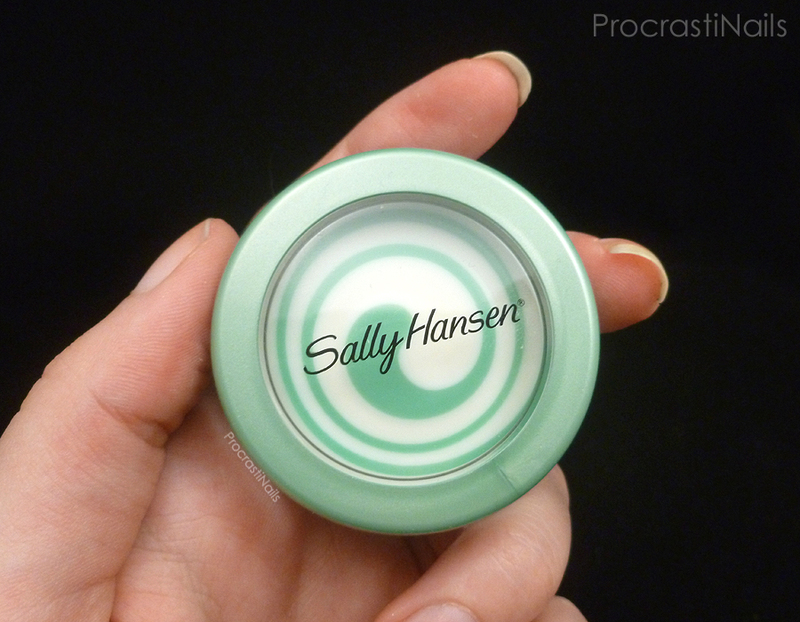 You can do better, Sally Hansen. Really. Have you ever tried this product? Has similar or different experiences? I'd love to hear about it! Nice review on this! Never tried it myself and probably won't too. I bought this when it came out and think of it more as a cuticle balm. I suppose it is a stretch, but for a normal consumer, just using a balm at all will prevent their cuticles from clinging halfway down the nail bed due to dryness. Thanks for reviewing this! It had been on my radar as something to look for. I won't bother now! It's not an instant remover, and that's why you're so disappointed. It never said it would remove them right away. It's a moisturizer, so as it moisturizes, it "erases" or prevents the cuticles from becoming dry enough to stick to the nail plate. It's not an overnight or immediate fix, its main goal is to moisturize to prevent cuticles from sticking, so they're easier to remove or stay gone. I've been using this for awhile now, and I only have to remove any cuticle once or twice a month. If that.